My Morris Minor (1971) will not start!! 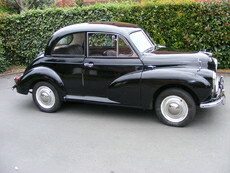 I am becoming increasingly frustrated as my Morris Minor (1971 saloon) will not start. It's a very original genuine low mileage car, still positive earth, with the dynamo. It was running well about a month ago, but left for a few weeks, but now refuses to start. There is a spark at all plugs and points, fuel is being pumped to carburettor. I've replaced HT leads, coil, condenser, checked rotor arm & LT lead....but will not fire at all! It turns over with ease. I've checked float chamber, replaced the needle & seat valve. Still no joy! Kevin Murray - Coventry Area. Re: My car won't start! You say there is a spark at the plugs - is it a nice, fat bue one? Is it possible you put the HT leads back on in the wrong order? Should be 1342 anti-clockwise. Re: My Morris Minor (1971) will not start!! See my comments in the electrical section.......unlikely to be anything serious if it was running fine a month ago. Always best to do a methodical series of tests before replacing various components. If you had a spark, why did you change all those ignition parts? Or was there no spark when you first tried to start it? As moj, it is likely it is timed wrong. Or the fuel has ‘gone off’. Where you start, for replacing plug leads, is important, to! Basically you have changed too many things to make any sensible guess as to your particular fault and we don’t know how well it was actually running before it was laid up. Welcome, I'm sure you'll soon have it running properly. These engines are very simple: Fuel/air + compression + spark at correct time = go. Think back. If I understand correctly, it was running fine a month ago and then would not start. Was anything done to it before it refused to start? There is usually a cause to this sort of thing, but perhaps it was as simple as cold / damp weather and wrong choke setting? You had a spark at each plug. Is that before or after you changed everything, so you still have a spark at all four plugs? How old is the fuel? Do you use the car often enough to keep the fuel fresh is is it old? Sometimes new fuel works wonders. Do you have compression on all four cylinders? You don't need a tester, just remove all plugs and then cover each hole in turn with your thumb whilst turning the engine on the handle - you will soon feel the pressure. I'm wondering if the plug leads are on the correct plugs? Thanks to all for your comments & suggestions. I did the usual checks before replacing anything, so I don't believe the replaced parts are the issue. The car was not used for over a year and stored under a cover outside. I added fuel wen I put it on the road in the summer. It ran well for a few months, so I'm surprised that it will not start now. I will carry out a compression test, as suggested, but it seems to turn over well. Reading an earlier post, it was suggested that the flexible pipe between carburettor and float chamber can get blocked with jelly-like fuel deposit...I will check this tomorrow. My van has the same problem sometimes and I use mine 3 to 4 times a week. Sometimes I go to use it and will not start and I leave it for a little while and go back it starts first time as if nothing is wrong with it. Its worse when its been really damp weather. "Thanks to all for your comments & suggestions." Well, yes, but we will be able to help you better if you answer our questions. The fact that it turns over well has nothing to do with the quality of the compression. So, again - you say you have a spark at each plug........ is each spark plug giving a nice, fat, blue spark? Are you sure you fitted the new HT leads in exactly the same firing sequence as the ones you took off? If we can eliminate the ignition system from the diagnosis, we can then start to look at the fuel system. I suspect that you have some poor insulation on the ignition circuits, both/either high and low tension. The damp conducts electricity through cracked insulation which shorts to earth. Inspect and renew as necessary. Make sure that all covers are in place. Alternatively, you have condensation inside distributor cap - wipe it dry. Holts Damp Start is a spray sealant that can be used on dry components to prevent poor starting in damp weather. Modern petrol goes off very quickly and it becomes less volatile. I once had a similar refusal to start one spring after my Austin 7 had stood in the garage all winter, I tried everything to no avail it just would not fire at all, the annoying thing was that it drove into the garage under its own power a few months earlier. I thought I had tried everything, that is until I drained the carb and refilled the float chamber with NEW petrol, hey presto it fired straight away and ran like a sewing machine again. Once it was running I reconnected the hose from the pump and surprisingly it still ran on the old fuel coming from the tank. Agree with that! Been there. Old cars don't respond too well to a period of standing but a splash of new fuel in the carb often seems to do the trick. Thanks to all for your input with suggestions and ideas to get my Morris fired-up, but still no joy! I have checked the lower short flexible pipe between float chamber and carburretor for blockage, but it is running clear. I have carried out a compression test of cylinders, and they are looking good (160, 158, 160 & 158) - so head gasket seems OK! Plugs are wet with fuel when engine is turned over, a good spark at plugs....so its a real conundrum as to why it will not start! Leads are all correctly connected, usual checks of points, rotor arm and condenser carried out - I'm getting very frustrated! Could it possibly be the voltage regulator?...although I understand this is to prevent overcharging of battery by the dynamo. Please offer any further potential solutions to this. Could it possibly be the voltage regulator?. If you have sufficient compression,the correct mixture of air and volatile fuel and a good spark at the right time it will run. One, or more, of those is wrong. Try Bradex, or similar, engine start spray. Try warming the engine to near normal operating condition. Try a good tow start. All ploys to overcome human shortfalls. Even an unlit gas burner directed into the intake could be tried, if experienced enough not to explode the gas in the wrong place! You have reported the plugs are wet with fuel, that compression is good and that there is a spark at every plug. That leaves fuel is not sufficiently volatile, the spark is at the wrong time, or there is Insufficient air (engine is ‘flooded’ with fuel) to enable the mixture to ignite. Take each plug out and make sure it is dried off, then put about a thimble full of neat BRAND NEW petrol down each plug hole. Put the plugs back in and try it again, if it coughs and splutters then stops again your supply of fuel to the carb has "gone off" and is not volatile enough to start the engine. Drain the carb and refill it with BRAND NEW fuel, and see if it runs a little longer, that will prove it once and for all if the fuel is at fault. The danger is to randomly try all sorts of things and you will not get anywhere, do things in a logical order and eliminate the obvious problems first. You are reporting good spark, so as well as fuel (but still one test at a time) check the timing. Remove number 1 plug (the very front one), put your thumb over the hole and turn engine by hand until you feel pressure building. Watch the piston through the plug hole and when it has reached the top, look into the distributor and check the position of the rotor arm. Whichever plug lead is adjacent to the arm, connect that to number 1 plug (after refitting it). Working anti-clockwise around the distributor, the next lead should go to number 3, then number 4 and finally number 2. If still no joy, then check that the points are opening at the correct point - use the timing marks at the bottom of the timing chain cover and the mark on the crankshaft pulley. Ask if you need more guidance on this. What is the spark like at the plugs, it should be a small but bright blue spark. If the spark is a fat white one instead throw the plugs away and fit new ones, it often happens after running the engine on old fuel for a while and the white spark gets blown out by the compression. That is a new one on me! I have several engines that one might consider as running on ‘old’ fuel - so less volatile than petrol that it is actually kerosene. Have to start them with petrol from cold, mind! And they run on a compression ratio of 4 or 5 to one (much higher and they knock due to pre-ignition).One should be able to discern burned electrodes on plugs. As long as the electrodes are still square (not seriously rounded or pointed) they should still work at a sufficientl level to get the engine running. Have you tried a Cold Start Spray? Basically what oliver90owner said yesterday about Bradex (other brands are available), but I would not attempt his suggestion of an unlit gas burner, which is Propane or Butane, those are heavier than air and will fall to the floor. Back in the 70's when I first started driving, 2 essentials for a winter were a Damp Proofing spray to stop any HT tracking issues and a Cold Start spray to spray into the intake on a cold morning. Cold Start spray is basically volatile fumes like methane, but must be used sparingly; only about 2-3 seconds into the intake before turning it over. People in UK tend not to use such items these days with modern ignition systems, but they're still common in far colder climates. Some old top end motors, basically ones like Mercs, Porche etc used to have inbuilt Cold Start injectors to save their drivers having to get under the bonnet. A friend of mine called around today, to help me get my car fired-up and running. He is an experienced engineer, having a number of classic cars over the years. However, despite spending a couple of hours in the cold weather, we were unable to get it started! He fitted a spark tester between plugs & HT leads, it showed a good spark! He sprayed easy-start into carburettor, checked all leads were correctly fitted (1-3-4-2) - and still no joy! I intend to replace the distributor cap and fit new plugs, but I'm running out of ideas after trying all the above. I appreciate the input and suggestion from you guys.